Tuesday’s primary election is one of the most packed primary tickets in recent years. The race between Reps. Lora Reinbold and Dan Saddler will play a big role in shaping the Senate the next session (a Reinbold win, which we would say is likely, would pull the chamber even further to the right). There’s Rep. Charisse Millett who’s in a tough primary challenge with veteran Josh Revak with a tough general election race down the road, and there’s a bitter three-way race in South Anchorage between Laddie Shaw, Albert Fogle and Joe Riggs. Voters in Anchorage’s super-blue House District 20 will be treated to a rare competitive Democratic primary against the Rep. Les Gara-endorsed Zack Fields, Elias Rojas and Cliff Groh. Republicans will also crown their candidate for governor with the leading candidates being Mead Treadwell and Mike Dunleavy. But it’s a collection of five House Republican primary races that stand to have the biggest immediate impact on Alaska politics. These five races pit moderate Republicans against conservative Republicans and will help determine the future of the House Bipartisan Coalition, an alliance of Democrats and moderate Republicans that seized control of the House after the 2016 election. Moderate victories in these races on Tuesday will help cement the coalition’s numbers while losses will make key general election races that much more critical. 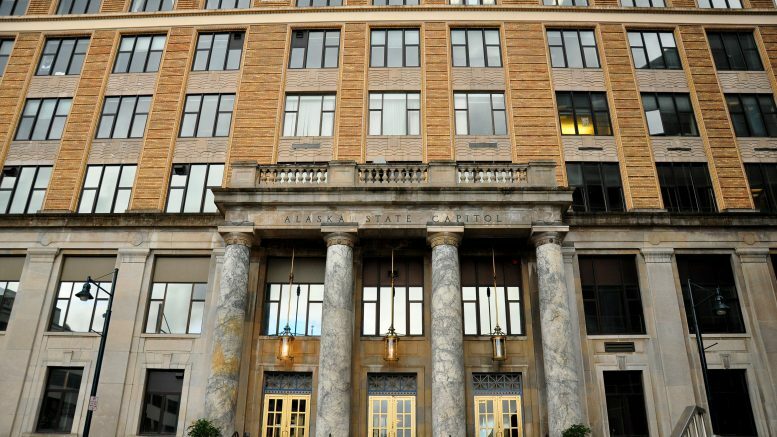 The primary battle for House District 9, which reaches from Delta to Valdez with some detours into the Mat-Su Valley, is one of the highest-stakes races of the day and is one of the House Bipartisan Coalition’s best shots at picking up a sure-fire ally. The race pits incumbent Rep. George Rauscher against moderate former Rep. Jim Colver and Constitution Party candidate-turned-Republican Pam Goode. Colver coined the Musk Ox Coalition–a group of moderate Republicans who went on to be the core of the House Bipartisan Coalition–before losing in the 2016 primary against Rauscher. Coalition-aligned groups are committing considerable resources to sending him back in the House. According to our breakdown of independent expenditure spending targeting the race (updated this morning), at least $89,248.49 has been spent by independent expenditure groups targeting the race. That’s by far the most of any legislative race on the primary ballot. Most of the spending has targeted either Colver (more than $50,000 alone has gone to supporting him) or Rauscher (who’s been the target of $9,000 opposing spending), but there’s been a last-minute injection of money supporting Goode (nearly $10,000) that’s been funded by Rep. Gabrielle LeDoux’s independent expenditure group. The thinking here is pretty clear: the far-right Goode already stands to be a spoiler for the conservative Rauscher (she took more than 2,000 votes in the 2016 general election against Rauscher) who himself barely eked out a win in 2016. Even without the intervention of independent expenditure groups, the landscape would already seem to suggest good things for Colver, but the enormous and politically conservatively diverse House District 9 has almost always provided a photo finish in the Republican primary. The two vacant Eagle River seats present a similar formula as House District 9 where union-backed groups are spending targeting candidates that they hope will be allies in Juneau. In House District 13, which was formerly held by Rep. Dan Saddler, those groups are backing former Rep. Nancy Dahlstrom and in House District 14, which was held by Rep. Lora Reinbold, the groups are coming in for Kelly Merrick. Dahlstrom’s top opponent fundraising-wise is Republican Craig Christenson while Merrick’s chief challenger is Jamie Allard, but both Dahlstrom and Merrick have leads in terms of fundraising. Merrick is far out front of the field with nearly $48,000 raised through the cycle. For as much Republican Party ire directed toward the House Republicans who caucused with Democrats–even going as far as trying to lamely ban them from their primaries–the party hasn’t really mounted much opposition against them. The challengers going up against Reps. Louise Stutes and Gabrielle LeDoux have raised anemic fundraising totals and there’s been little to no independent spending against them (LeDoux’s been targeted by $475 in Republican Party spending while Stutes hasn’t faced any backlash). Both have also individually smashed their competition when it comes to campaign fundraising, too. LeDoux has raised 38 times as much money than Republican challengers Aaron Weaver with her $106,398 to his $2,770. Rep. Gabrielle LeDoux may have caused plenty of frustration during the session as an often stubborn chair of the House Rules Committee, but it looks like she’s doing the most of anyone else to help with the survival of the House Bipartisan Coalition. It’s $5,500 from her PAC, the newly named Common Sense Conservative PAC, that is going to fund the independent expenditure group backing the House District 9 spoiler Pam Goode. Independent expenditure money has targeted the Houes District 32 primary between Stutes and Republican challenger Rich Walker. Walker’s been backed by Families of the Last Frontier, which lists its only contributions as the Republican Legislative Campaign Committee. Stutes has benefited from $8,000 of spending made by the union-backed Working Families of Alaska. Be the first to comment on "Five primary races will help determine the future of the House Bipartisan Coalition"